A lot of kids are dealing with major stressors at home. Meditation and mindfulness have been shown to help kids who are dealing with stressors. Nonetheless, many teachers and researchers point out that with kids there has to be a physical component, because asking kids to sit still and meditate right off the bat is not going to work, and it may actually backfire. Ali Smith, co-founder of the Holistic Life Foundation, recommends to do movement first, then breath work, then meditation. it’s obviously extremely important for teachers to be conscientious about what might be going on in the kids’ lives outside of school, and tailor the program accordingly. Meditation has been thought to benefit overall mental health in kids. Yoga itself has been shown to help reduce anxiety, depression, and fatigue in kids, compared to physical education alone. Although the research here is still young, I am sure you won´t neglect that emotional awareness of Eastern and Western children is completely different. 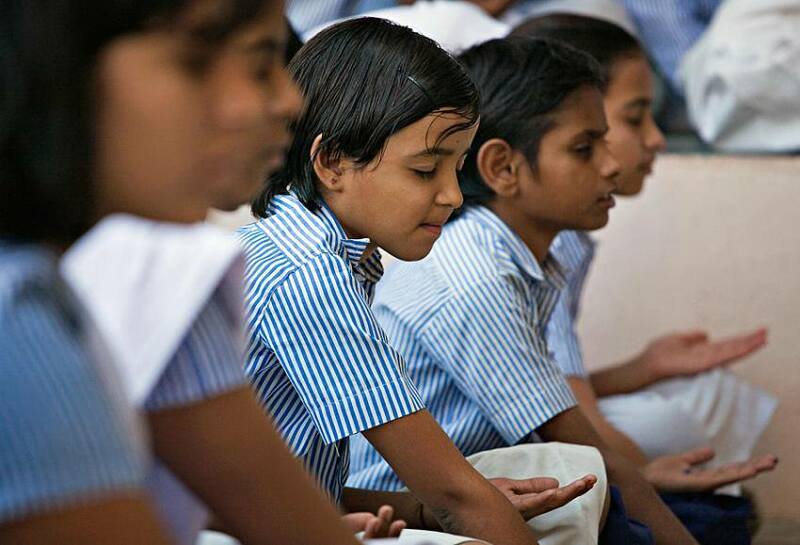 Meditation is an integral part of education program in India. In the majority of the schools, children have a splendid opportunity to learn and practice meditation. It is not even a part of an academic program. It is rather an activity that the mentors organize during the breaks. A result of embedding meditation in learning program is a positive effect on children mental health and emotional awareness. It reflects in the way kids interact with each other and with their teachers and parents. Satyani McFiercen, the meditation teacher who works within NGO Minds incorporated challenges the students at Eastern schools in Washington DC to examine their relationship with distracting thoughts. Look for a thought. Where is it? Satyani is not trying to teach her students to get rid of their thoughts but to change their relation to this thoughts. She is a part of a growing movement that aims to bring meditation to public schools. To help children understand the connection between their emotions and their bodies, it is necessary to explain to them how the brain works! In some cases, meditation inspires kindness to others, and there’s some evidence here. One study found that a social-emotional learning program coupled with mindfulness helped kids to develop more empathy and emotional control, be more perspective-taking. They also became more “prosocial,” and had lower levels of the stress hormone cortisol than their counterparts in the control group. According to Lisa Flynn, Yoga 4 Classrooms founder, “Kids who practice yoga, meditation and mindfulness build skills of attention, self-awareness, self-management leading to more responsible decision making and prosocial behavior. It’s no surprise that studies show that these kids are, in general, happier, more resilient children. They have a solid sense of self and are more connected to, and respectful of, others and the world around them. As a result, children are becoming kinder and more compassionate!" Let's hope that more schools will introduce this practice in their teaching programmes. While it is still not so common, you can make an experiment and try to teach your children meditation at home. Try it out, observe your children's reaction and make the conclusion if it makes a difference.